Preheat oven to 350F. Butter a 9″ round cake pan and line with parchment paper. Over a bain marie, heat eggs and remaining 2/3 C sugar to 110F. Transfer the egg mixture to a standing mixer. Using a whisk attachment, whip until mixture is thick and pale yellow, and about three times the original volume. Gently fold in the dry ingredients, butter and vanilla. Scald cream and pour over chocolate. Let site for 2 minutes. Mix together and cool to room temperature. Slice cooled cake crosswise and brush both halves with simple syrup. Place one half of the cake on a serving platter or cake board. Spread half of the chocolate mousse evenly over the cake. 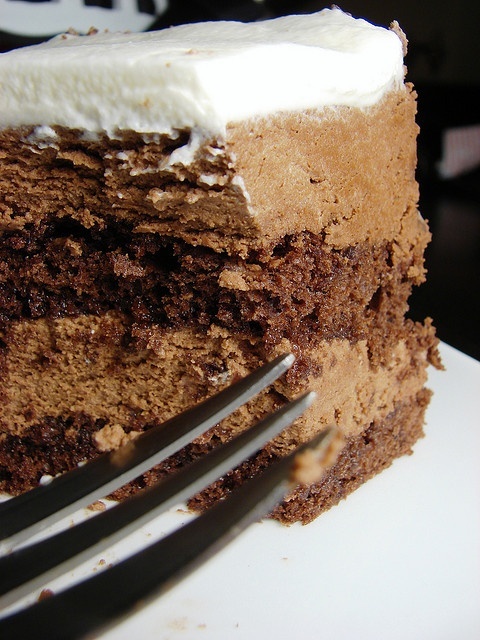 Top with the other cake half and repeat with the chocolate mousse. Chill until mousse sets, and then top with the sweetened whipped cream. Garnish with chopped chocolate.